Get 40% in coupon. Buy "Chia Seeds 250 g" and get a coupon worth £1.06. Get 20% discount in "Chia Seeds 250 g" and save £0.53. Get 40% in coupon. Buy "Chia Seeds 500 g" and get a coupon worth £1.76. Get 20% discount in "Chia Seeds 500 g" and save £0.88. Get 40% in coupon. Buy "Chia Seeds 1 Kg" and get a coupon worth £3.17. Get 20% discount in "Chia Seeds 1 Kg" and save £1.59. Given their rich nutritional content and versatility, chia seeds are now considered to be one of the healthiest food on Earth! Loaded with health-boosting and energy-giving nutrients, Chia Seeds make an essential addition to any health-oriented diet. 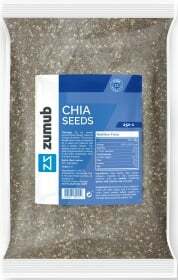 If you are looking for top quality chia Seeds for your diet, Zumub Chia Seeds is the way to go! Back in the day, the ancient Mayans and Aztecs relied on chia seeds to give them sustenance, energy, and vigor. In fact, the word “chia” means “strength” in the Mayan language. Chia seeds are packed with protein, carbs, dietary fiber, healthy fats, such as mono and polyunsaturated, vitamins, minerals, such as vitamins from complex B, calcium, magnesium, and potassium, and antioxidants – making them a valuable source of nutrition for fitness-oriented people like you to support your overall well-being. In addition to boost your energy levels, to complement your physically active lifestyle, to give you antioxidant protection and to support your digestive system, chia seeds can also be a valuable ally for those who are trying to lose weight. Chia seeds absorb water and expand in your stomach, creating a feeling of fullness and minimizing your caloric intake in the process. Zumub Chia Seeds can be consumed in many ways, directly out of the pack, whole or crushed, or mixed with other seeds of your choice. Chia seeds may be used for boosting the nutritional value of your beverages and meals. Harness the many benefits of this well-loved superfood and enjoy more vigor, energy, strength, and vitality each day... try Zumub Chia Seeds today! Have a question about Chia Seeds? What is it, what does it do, how and when to use or something else? Ask us. “Chia Seeds 125g” is currently out of stock. Enter your details below and we will let you know when it's back in stock. ALLERGEN INFORMATION: May contain allergens handled in the production facility: cereals containing gluten, soybeans, milk, lactose and nuts. Consume whole, crushed or mixed with other seeds. Add it to shakes. cakes, bread, cereals, salads, yogurts or other dishes to boost their nutritional value. WARNINGS Chia Seeds : The daily dose should not exceed 15g. Do not exceed recommended daily dosage! This product should not be used as a substitute for a varied and balanced diet & healthy lifestyle. This product should not be used in case of hypersensitivity or allergy to any of its constituents. Keep out of reach of children. BEST BEFORE: Please see lot number and expiration date stamped on the packaging. Store in a cool, dry place.